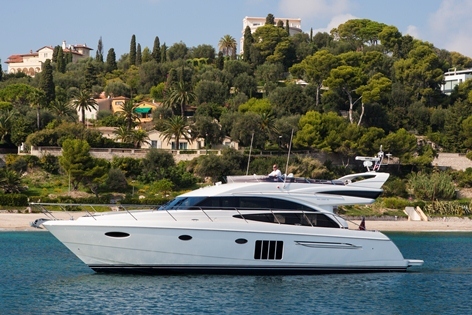 Motor yacht CALYPSO was delivered by Princess Yachts in 2012, the 18.6m (61ft) yacht boasts a sleek hull design, ample exterior entertainment option and a modern refined interior. 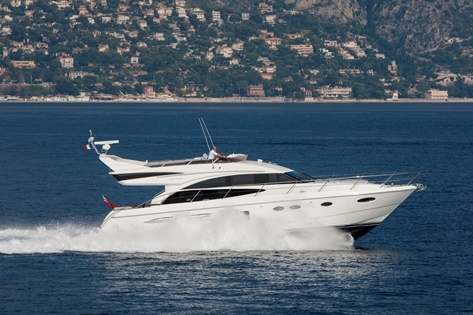 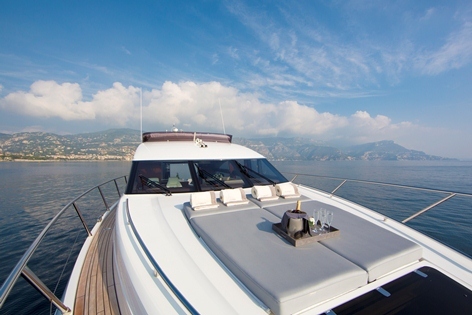 Charter yacht CALYPSO is available in the South of France for up to 6 guests in 3 cabins. 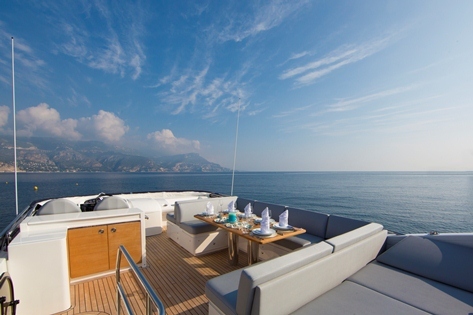 M/Y CALYPSO has a light airy salon with muted neutral colours creating a simplistic elegant atmosphere. 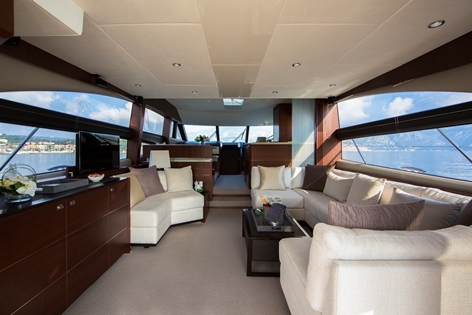 The salon is aft with an L shaped sofa and love seat, coffee table and full entertainment system. 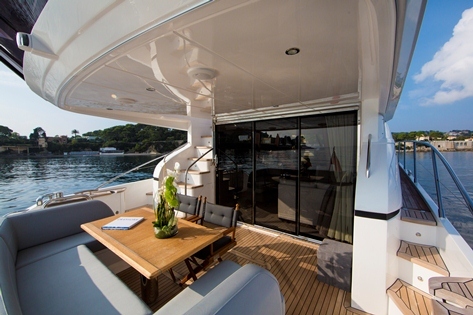 Wide sliding glass doors open onto the generous aft deck and shaded alfresco dining option. 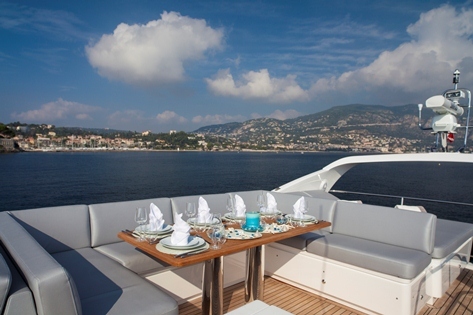 Forward of the salon, a formal dining table is raised on the port side, with the galley on the starboard. 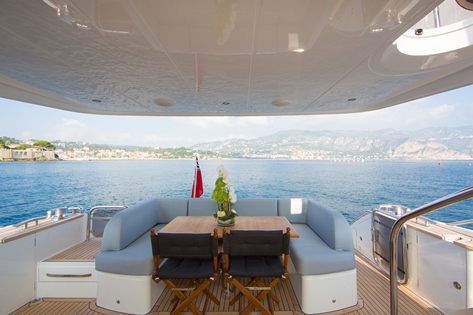 The entire salon and dining space is flanked by panoramic windows allowing ample natural light and uninterrupted views. 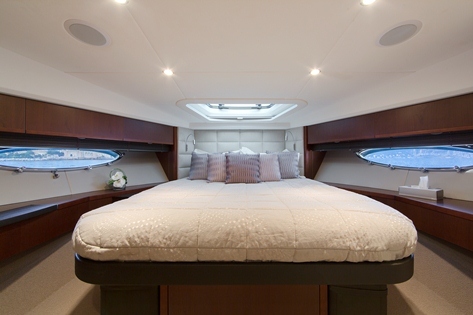 Below decks, guest accommodation is in 2 double and one twin convertible cabin. 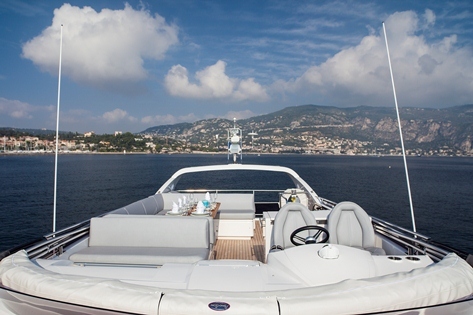 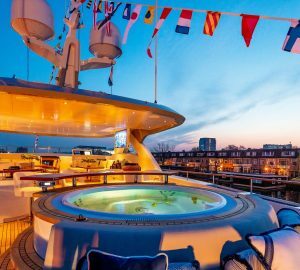 Princess 60 yacht CALYPSO offers plenty of outdoor areas to relax. 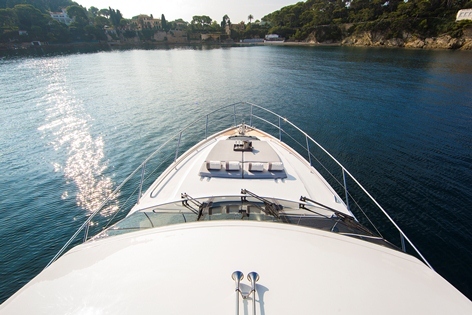 The aft deck has an alfresco dining option and comfortable seating, further aft the extended swim platform is full beam of the yacht and boasts a hydraulic lowering system making water access easy for all. 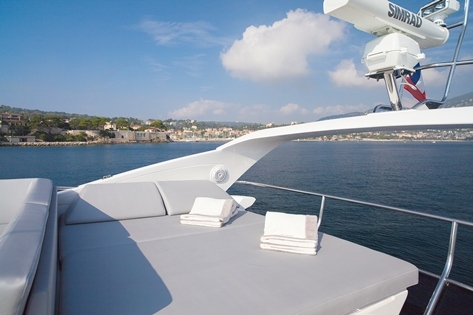 Forward on the yacht, a double sunpad is ideal for a quick escape and quite moment. 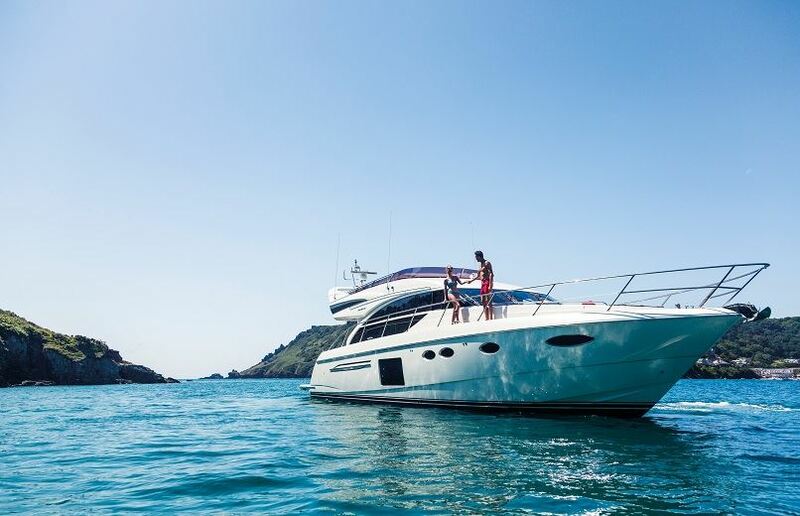 Motor yacht CALYPSO boasts a well-equipped flybridge with a further double sunpad, alfresco dining option, BBQ and collapsible Bimini cover, perfect for entertaining. 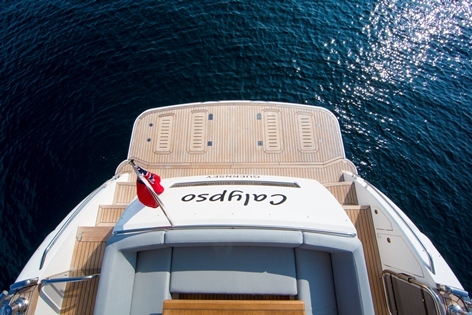 Princess yacht CALYPSO has a beam of 4.8m (15.8ft) and a draft of 1.95m (6.4ft), she is powered by 2 Volvo 900hp engines able to cruise at 25 knots and reach top speeds of 36 knots. 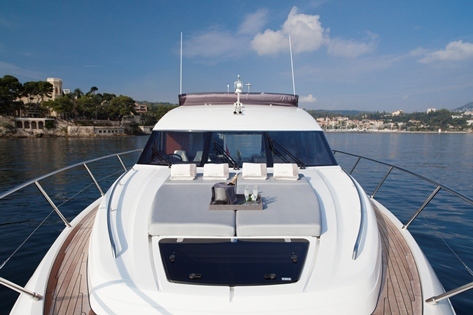 Luxury and elegance defines the accommodation on the CALYPSO motor yacht. 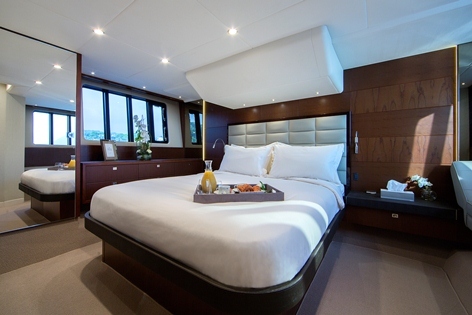 The master stateroom is bright thanks to the custom designed hull windows on port and starboard, offering a center lined queen size bed, love seat, vanity and en-suite facilities. 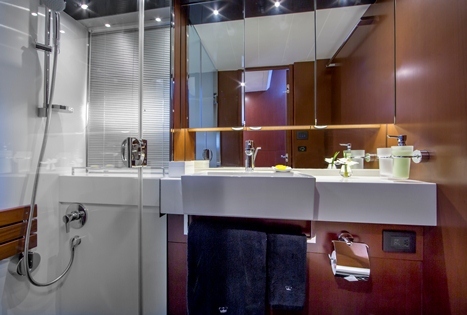 A VIP cabin is forward with a double bed and en-suite facilities that also double as the day head. 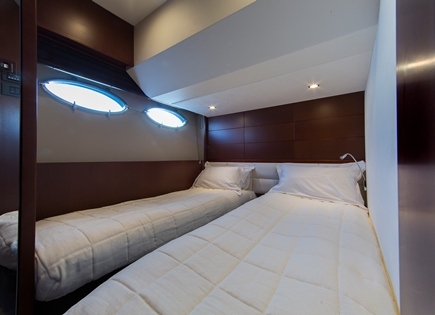 A further twin cabin offers 2 side by side single beds which can convert into a double if required, this cabin also has en-suite facilities. 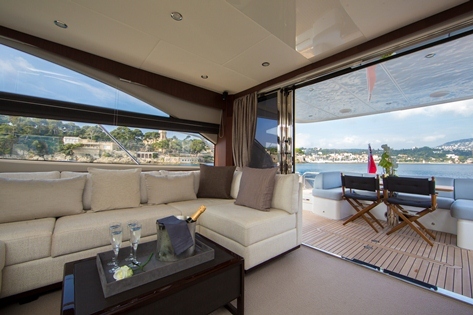 The master and VIP cabins have full TV and audio entertainment systems. 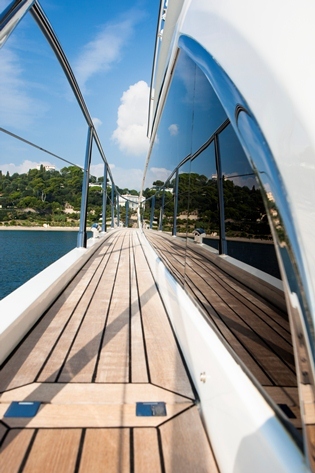 Each cabin boasts a minimalistic neutral décor.